There is more to Goa, it is just not beaches and churches. Usgalimal is a small village in the interiors of South Goa. This place very close to mining area is one of the most important prehistoric sites in India. To reach this place we had to ask lot of people for directions and little known place is a must visit. To reach this place one has to walk across a small wooden bridge. One can see lot of rock arts on the banks of river Kushavati that exhibit earliest traces of human settlement in India. They are approximately 20,000 to 30,000 years old. More than 100 distinct rock engravings are carved on laterite stones, spread an area of 500 sqm depicting images of bulls, peacock, labyrinths and human figures. This art is outside the village, and a winding pathway leads to this place. It is about 1 km interiors down from the main road between Rivona to Neturlim. Another lost gem to be discovered! Very interesting site on discovery! Must be little adventure crossing the river to reach the destination. Amazing and so very beautiful!! Wishing you well!! What a jungle! It looks like a home of Mowgli. And those ancient art looks so old! It might be a great experince to see those! What a fascinating place, Rajesh, and great captures for the day!! Thanks as always for sharing!! Have a great new week!! This is amazing. Never heard of it before. What an amazing place - that's antiquity that I can't even imagine. Nice to read about Usgalimal, Amazing. What a fascinating place....it must have been so humbling to visit such prehistoric places...so much history and that bridge looked a bit unsteady. Just the thought of crossing that bridge makes me dizzy! lol But it looks like a very fascinating spot. First time I hear about a pre-historic site in India. A hidden gem indeed. Thanks for sharing. The age of this area is mind boggling. And to think the artwork has survived. I hope it is protected. Such an interesting post this week. Amazing rock art. Absolutely fascinating. 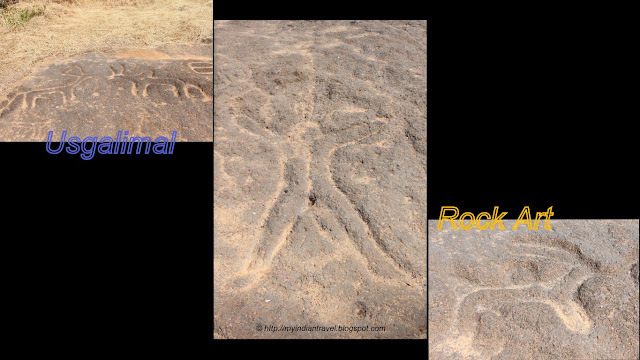 More than 100 distinct rock engravings are carved on laterite stones, spread an area of 500 sqm depicting images of bulls, peacock, labyrinths and human figures.Beautiful pictures with brief intro . Thnx for this series. Unbelievable !!!!!! 20,000-30,000 years old...there are so many things to learn. Thanks for sharing, never heard bat this place. Goa , means beaches, this is something different. very interesting to read about this aspect og Goa which hitherto was unknown to me...awestruck by the inscriptions!